**In this “wonderfully rich” (San Francisco Chronicle) novel, a young man journeys from California to Cairo to unravel centuries-old family secrets. 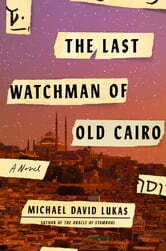 The Last Watchman of Old Cairois a moving page-turner of a novel from acclaimed storyteller Michael David Lukas. This tightly woven multigenerational tale illuminates the tensions that have torn communities apart and the unlikely forces—potent magic, forbidden love—that boldly attempt to bridge that divide. While this book seemed intriguing at first glance, I found the parallel stories over a century apart to be tedious. A disappointing read. It took me about 30% of this book, a good 100 pages or more to really 'get' The Last Watchman of Old Cairo. At first it felt very disjointed. There were multiple timelines and people but none of them were meshing in my brain and I couldn't figure out how each generation was related to the next as we jumped around. However, there is a point at which it just clicked for me. I hope for other readers that point will come earlier than it took for me as this is a wonderful story once you get into it. Plot It's all about a scroll. That's not clear from the beginning but if the One Ring in LOTR is the plot driver then the Ezra Scroll is the plot driver in Michael David Lukas historical story. Where is the scroll? Who has the scroll? Is it magical? etc. These questions are asked over and over again by each of our characters in all the different generations that this story spans. There's other things happening as well. Lots of hiding, sneaking, and even some minor spying. But for the most part this is a story about protecting a synagogue and it's treasures (of which the scroll is purported to be one). Characters The two older ladies in this book are my absolute favourite. They are not a part of the line of watchmen that we follow in the other timelines; but they are just as adamant about protecting and 'watching' over the previous documents than any of our watchmen are. Additionally I felt like I got the most out of their analysis of the situations and things that may have happened. Without them in the middle I do not know that I would have been able to understand all the nuances of this book as easily. While all the other characters are men I don't think this is a gender bias (as I am female); but instead just the overall way the ladies can look at the larger situation helped to see the whole picture at a different level than our watchmen can see it. Forgiveness There is an interesting tone throughout The Last Watchman of Cairo that I was not expecting. This is actually a book about forgiveness and knowing when it's okay to say a mistake is tolerable. Our characters make lots of mistakes in Cairo and many of them are forgiven in some way or another. This was a piece of the story I didn't expect based on the blurb or the beginning. It was nice to see such a clear morale in the book that didn't have anything to do with revenge or vengeance; but merely with what a measure of a man (or woman) might be. If they are a worthy person then they should ultimately be worthy of forgiveness. Writing Style The best part of this book isn't even the exotic (to me) setting of Cairo (which I learned lots about! ), nor is it the religious 'clash' between the Jews and the Muslims; instead it is the style of author Lukas. There is a melody, pace and cadence to Lukas' writing that is stunning. Once I got into the story and was really pulled into the events and characters I realized that part of my struggle to get into the book was to find the beat that Lukas used to write it. Similar to some poetry where you need to understand the cadence of a poem for it to sound right. I don't know at what point I realized it was a gorgeous and unique style of writing; all I know is that by the end I was sad to let the beat go. 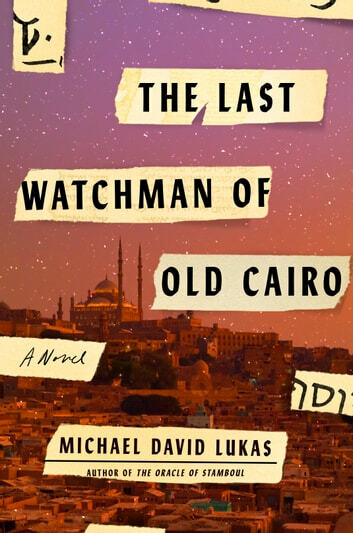 Overall The Last Watchman of Cairo was a truly magical book, even if it held little to no actual magic. There is a gentleness with which Lukas has set-up the religious clash and dangers of Cairo (in each time period) that contributes to the way we view the characters and actions. If you have interest in reading about a different history than you've probably ever heard, in a city that is not often written about; then I definitely recommend this book. Lukas has really captured a story that intrigued me; and the best part of it all, much of the story is true! I do love these historical books that have nuggets of truth in them and where the authors have spent time to research and understand the place, people and times that they are writing about. I will be on the lookout for more stories from Lukas and I hope they are just as unique and interesting as this one is. Please note: I received an eARC of this book from the publisher via NetGalley. This is an honest and unbiased review.